When it comes to quality, dependability and product diversity, Vulcan Signs has a proven track record in the traffic control industry. Since 1966, Vulcan Signs has done much more than manufacture quality products for traffic control; we have made a commitment to the industry that is second to none. Our latest plant expansion doubled our production facilities, enabling us to provide the most complete selection of MUTCD compliant traffic control signs and products available today. Also, the addition of our state-of-the-art digital printer and laser cutter has enhanced our ability to provide high quality, custom signage solutions for the commercial market. 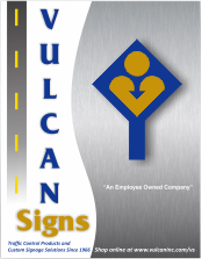 Through our position as a forward-thinking company and our unique position with Vulcan Signs, Vulcan Signs is a market leader in providing the highest-quality products, customer service, and the most competitive prices available. Custom Laser Cut and Digitally Printed Signs Available! Call or Click Today for a Quote! © Vulcan, Inc. © 2017.